British 'plug-in' hybrid revealed | What Car? 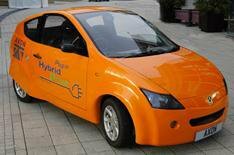 A new British manufacturer has revealed a 'plug-in' hybrid model that it plans to produce within two years. The Axon Hybrid will be able to operate in full electric mode using a battery pack that can be recharged from the mains and with a petrol engine that can take over on longer journeys. The British-developed Axon Hybrid will have two seats and decent space for luggage. The car will make use of recycled materials, including re-used carbonfibre for the door panels. The company claims that taking into account the power station emissions when the vehicle is driven in full electric mode the car will be capable of emitting the equivalent of just 50g/km of CO2. Axon is planning to sell the car in other countries through localised production in small factories, too. 'In terms of cost, we're going to be competitive with full-electric vehicles, but we haven't set the final price yet,' said Cousins.